Did you know that The American Psychiatric Association estimates that 3%-7% of school-aged children have ADHD, while parents report that about 9.5% of children between 9- and 7 years old suffer from the condition? Although these statistics are alarming, they aren’t as shocking as the fact that attention deficit hyperactivity disorder is a completely made-up ailment, according to the “father” of ADHD, Leon Eisenberg, who made the shocking admission in the last interview before his death. A psychiatrist and key player in the developmental research behind autism, ADHD, and psychiatry as a whole, Leon Eisenberg concocted the theory of attention deficit hyperactivity disorder decades ago. The disease first haunted the Diagnostic and Statistical Manual of Mental Disorders as hyperkinetic reaction of childhood, but is now labeled as ADHD. Unfortunately, it didn’t take long for Eisenberg’s theory on ADHD to become ‘concrete’ within the medical community, leading tens of millions of children to be heavily medicated with mind-altering drugs for virtually no justifiable reason. There is no question that the psychiatric community and their bible-like text known as the DSM are fueling disease and widespread medication prescriptions. In a world where creativity is deemed a “mental illness” by scientists and profits are to be made by shrinks and pharmaceutical companies, is it any wonder that a large portion of the population is on medications for some type of ‘mental illness’? 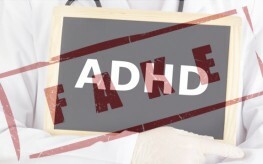 “ADHD is fraud intended to justify starting children on a life of drug addiction,” said Dr. Edward C. Hamlyn, a founding member of the Royal College of General Practitioners, back in 1998 about the phony condition. Thanks to Eisenberg and the rest of the psychiatric community (including big pharma), approximately, 24,357,000 ADHD medications were prescribed and refilled to children and teens in 2009. In fact, there is a frightening new trend where children from low-income families are prescribed ADHD meds to boost their academic performance. That’s right, kids that aren’t even suspected of ‘having’ the phony attention deficit hyperactivity disorder (ADHD). The amount of children being fed ADHD medications has risen so high over the years that pharmacies are actually struggling to obtain enough of the active ingredient used in the drug to ‘treat’ the ‘disease’, Adderall. Though Eisenberg admitted that ADHD was merely a theory on his death bed, it didn’t stop him and his colleagues from raking in the profits of unknowing parents and children. Which reminds us of something: it’s all about the money. Where there is no drug to profit from, create a new drug, and where there is no disease to profit from, simply create a new disease. It’s hardly surprising to hear that an astonishing 70% of the panel members of the DSM-5 reported having financial relationships with pharmaceutical companies. About 57% reported ties in the previous edition. Don’t fall for the pill scare. Countless parents have discovered that ‘treating’ an ADHD-riddled child is as easy as altering the junk-food diet he/she has had for years. In addition to implementing dietary changes, there are also other powerful natural remedies for ADHD that any parent can utilize. Interesting how you contradict yourself so much, from “made up” down to “just a theory ” to finally “and here are natural ways you should follow to treat this illness, just because I said so”. attacking pharmaceutical corruption is absolutely laudable and important, using something so sensitive and already diffucult to deal with as ADHD to do it was just cruel. We get enough people telling us to “just pay attention! !” Without you getting in the way too.